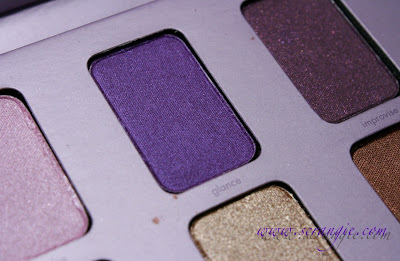 Stila seems to be on a roll with these new ten-shadow palettes. One last fall and then two more for Spring 2012? I can get on board with that. These things are great. 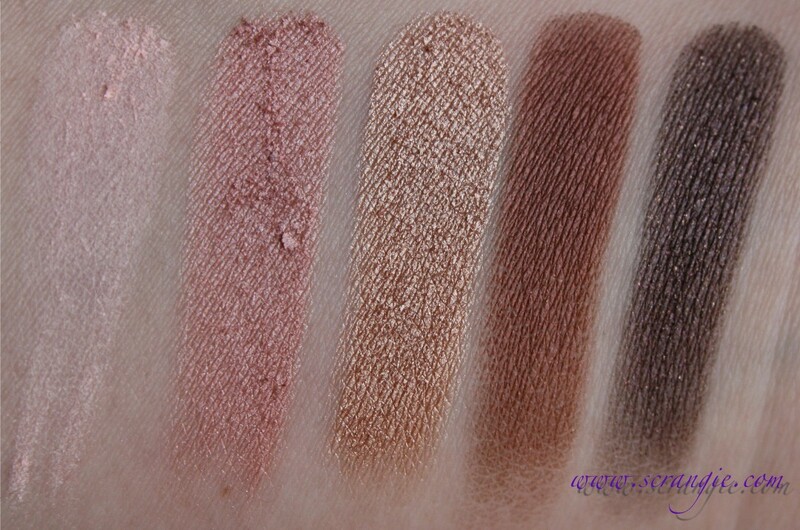 The shadows in these are regular Stila quality, not the watered-down "value set" formula. 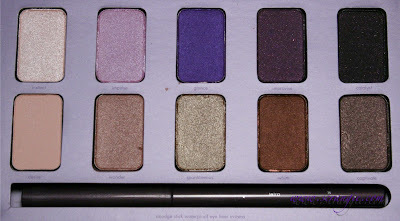 So, of course, as soon as I saw a purple palette, I had to have it. 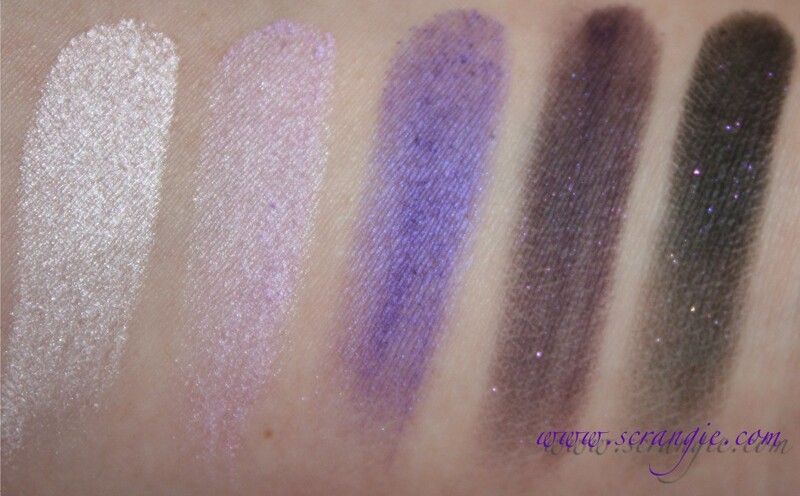 This latest one is called In The Moment and it's a Sephora exclusive. It's the same construction as the other two. 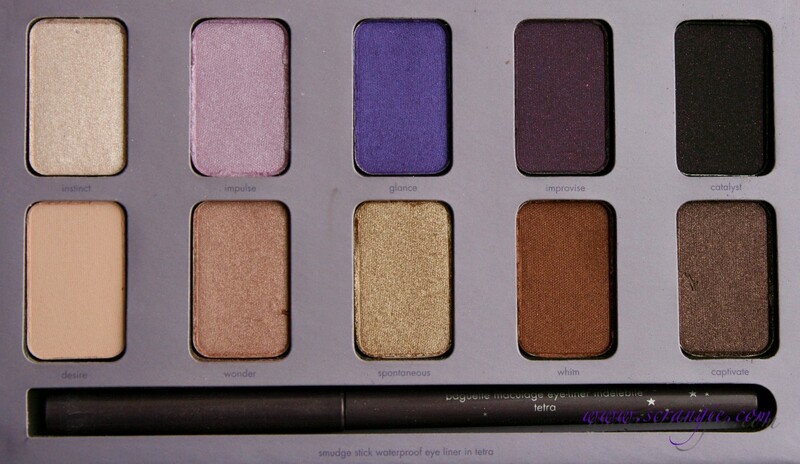 Cardboard palette, flip-open lid with gentle magnetic closure, ten full shadows and one full Smudge Stick liner. 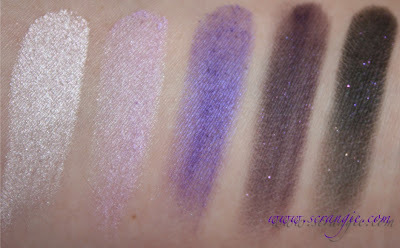 The Smudge Stick eyeliner that comes with this one is called Tetra, and it's a smoky purple shimmer. 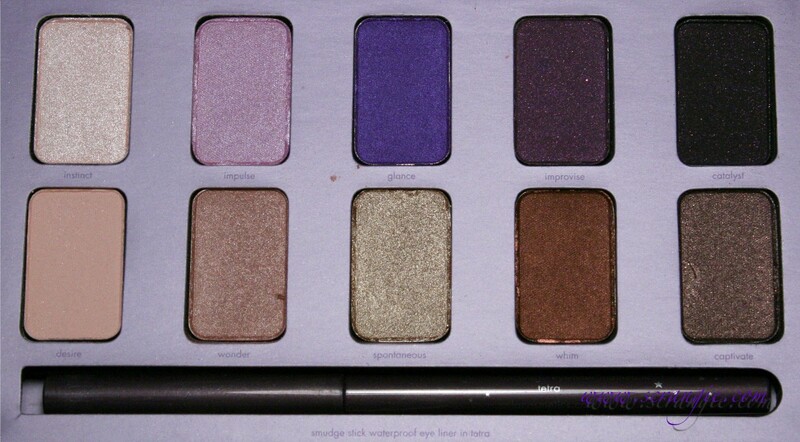 The eyeshadows in this one are: Instinct, Impulse, Glance, Improvise, Catalyst, Desire, Wonder, Spontaneous, Whim, and Captivate. 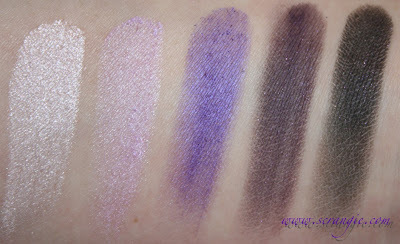 Really, I just wanted this palette for that purple shadow (Glance). It's so gorgeous looking in the pan. Slight blue duochrome to it. 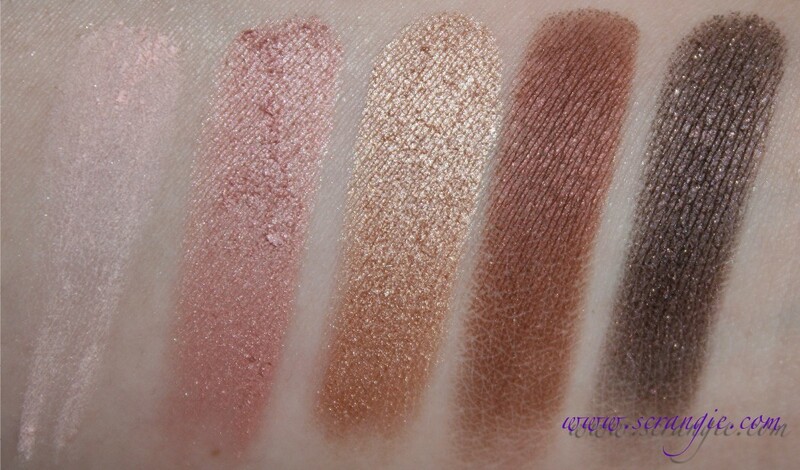 Swatched without primer, natural light and flash. Left to right: Instinct, Impulse, Glance, Improvise, Catalyst. Click on that last blurry picture if you want to see a closeup of the tiny rainbow shimmer in Improvise and Catalyst or the blue duochrome shimmer in Glance. Natural light and flash. Desire, Wonder, Spontaneous, Whim, Captivate. Stila Smudge Stick Eyeliner in Tetra (natural light and flash). I've only used this three times so far, but that's enough for me to form an opinion. So! 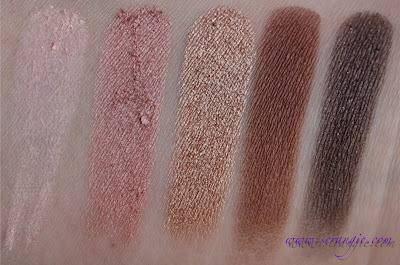 Cool-toned color selection works better on my skin than the warmer shades in the last two palettes. Contains a full size Smudge Stick. Eyeshadows have a very soft, silky texture. Most of the shadows have excellent payoff. There's a color light enough for a highlight and dark enough for a crease color, so it has every color I need for a complete look. This style of palette takes up little space for the amount of product inside and it stacks and stores nicely. These palettes smell really good, like new shoes. Comes with a booklet with ideas for looks using the palette. 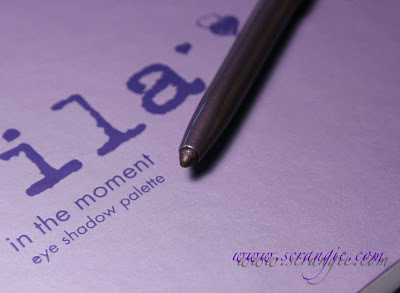 The shadow I looked forward to the most, Glance, had horrible pigmentation. It swatched well on my arm, but when I've tried to apply it, it barely shows up and goes on streaky. The color also starts to fade immediately after applying. The shimmer tends to blend out of the darker shades, leaving you with just plain black or brown. The Tetra smudgestick isn't very pigmented and I had to go over my line several times to make it opaque. The Whim shadow is very deceptive. 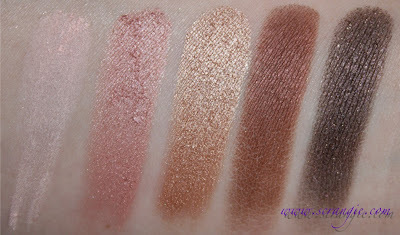 In the pan, it looks like a bright semi-metallic copper, but it applies as a coppery-brown with only a little shimmer. Can't help but feel that the color selections in the last three palettes are very bland. Way too much brown. Not enough color. I'm on the fence about this one. On one hand, this one works better on me than the last two because the colors are mostly cool-toned... But on the other hand, it's still brown-heavy, a little boring, and doesn't really seem all that different from the other two. The only color that sets this one apart from the others is the bright purple, but it had rather poor application, so it's not really worth buying the whole palette for. I'd say that this is still my favorite of the three, but they really need to start putting some more interesting colors in these. There's nothing unique here. I know that Stila is known for subtle/classic looks, but adding a little more color wouldn't hurt. I probably won't buy the next one if it's all browns/champagnes/neutrals with only one splash of color in it. 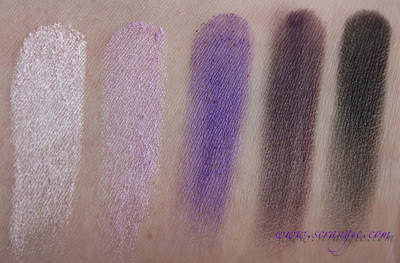 But, the quality is there, the shades all apply and blend well (with the exception of the purple), and it's very easy to wear, so this is really a nice palette for someone who doesn't already own seventy bajillion and therefore won't have duplicates of these colors. The Stila In The Moment palette is a Sephora exclusive and retails for $39. Sephora doesn't say that it's limited edition, so I'm going to assume that it's permanent. Nice set, I don't have any Stilla packages, I must invest in one. 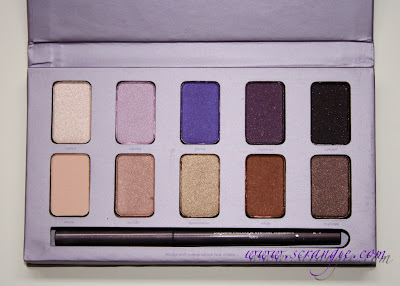 I've been considering this palette for a while, still haven't made up my mind! I bought In the Garden, all on account of your eye color being the same as mine, and I'm having fun playing with it. But yeah, I'm a cool, too. I think I'd really like this one. We just got a Sephora-in-Penney, too! I don't have any Stila Palettes. Pretty shades but ones that look like others I already have. I like all the Earth toned ones. I actually found this at Urban Outfitters in Ottawa today...$44 compared to the $50 at Sephora! I give it a 'Thumbs Up"